(Honolulu) —The ‘Aina Pono Hawai‘i State Farm to School Program has received much fanfare and recognition from students, farmers and state legislators for providing healthy school meals made with locally produced ingredients. Everyone wants to see the program succeed and grow, which has been the end goal for the Office of the Lieutenant Governor since it launched the program in 2015 and began collecting data. The program first began in three Kohala schools on the Big Island then moved to three more schools in Mililani. Currently, all six schools continue to provide fresh, locally-produced ingredients in scratch-cooked meals to nearly 4,000 students combined. Lt. Governor Chin, the Hawai‘i State Department of Education (HIDOE) and the Hawai‘i Department of Agriculture (DOA) continue to develop a strategic plan. Together with private stakeholders, they implemented the farm to school program and collected necessary data, including a statewide market research of the agriculture industry. This data provides the HIDOE with information directly from farmers, processors, and distributors. The research shows ag producers are willing to increase productions if they have access to long-term contracts, which will allow our schools to stimulate and support local agriculture. 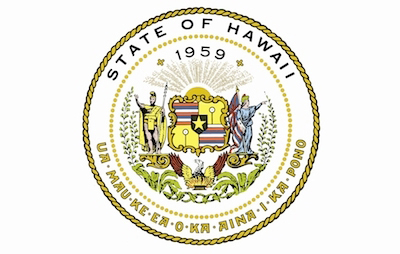 “The ‘Aina Pono Program is a great example of what happens when we create powerful public-private-community partnerships where the public-school system contributes to the economic development and growth of this state by being connected to our business and industry leaders to ensure a breadth of innovation opportunities for our students and our staff,” shared Superintendent Dr. Christina M. Kishimoto. Transformation is already underway at HIDOE’s School Food Services Branch through its ongoing development of market-driven menus featuring seasonal local products. The plan is to implement this concept to all public schools. That’s why local farmers and producers were asked to showcase their products to HIDOE buyers following the data sharing. On the 5thfloor, outside the Office of the Lt. Governor, they displayed a variety of products including venison, assorted vegetables, and ulu chocolate mousse. The goal was for HIDOE to think outside the usual box and consider different items for future school menus. Lt. Governor Chin and Dr. Kishimoto commended the many private and public stakeholders, who helped make the ‘Aina Pono Hawai‘i State Farm to School Programwhat it is today. They also presented special awards to members of the Kohala and Mililani schools for their commitment and making a difference in the farm to school program.